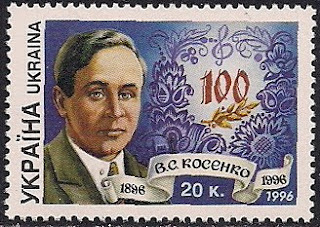 Stamps of Music K: Kosenko, Viktor S.
Viktor Stepanovych Kosenko(1896-1938), Ukrainian composer, pianist and teacher. He graduated from St. Petersburg Conservatory in 1918, he taught at the Music Technicum, the N. V. Lysenko Institute of Music and Drama, and the Kiev Conservatory. He was active as concert soloist and teacher. His compositions drew on the best traditions of Russian and Ukrainian folk music. He composed an opera(unfinished), a violin concerto, violin sonatas, a piano concerto, and orchestral music.